Stamped design provides a smooth underside, with fewer sharp corners, for reduced material buildup. The front edge of the deck is raised above the blade plane to allow even cutting of tall grass. Wide discharge opening gives even clipping dispersal and excellent finished appearance. 1/4-inch (6.4-mm) cut-height increments allow fine-tuning the height of cut grass. 7-gauge (0.180-inch, 4.6-mm) stamped-steel material gives excellent durability. Stamped design eliminates welds on the shell and provides rounded corners that distribute impact stress when the mower contacts obstacles like trees, rocks, and curbs. A 5/8-inch (16-mm) solid steel bar is welded to the mower deck perimeter for added strength and protection. Heat-treated 1-inch (25-mm) cold-forged blade spindles are supported by ball bearings to provide reliability and long life. Large anti-scalp wheels provide durability and smooth operation. 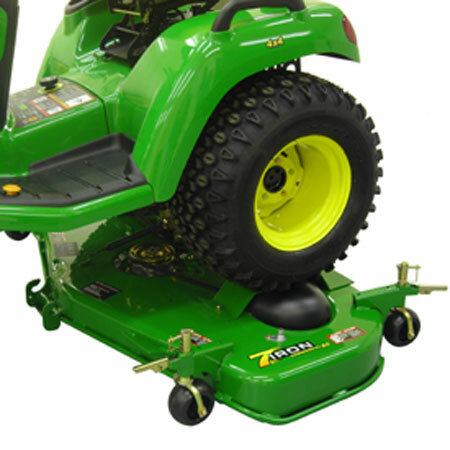 Quick-change mower wheel height adjusters are easy to use. A wash port on the left-hand side of the deck is standard equipment for easy cleanout. 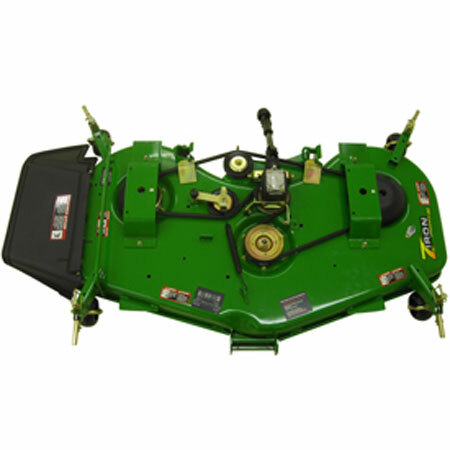 Easy installation and removal of the mower drive shaft makes quick work of putting the mower on or taking it off the tractor. On-ramp feature simplifies installation and removal of the mower. Minimal physical effort is required for installation or removal. 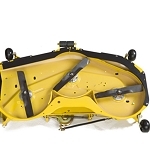 The on-ramp feature simplifies installation and removal of the 60-inch 7-Iron Mower Deck. Being able to drive over the mower deck eliminates the work of rolling it under the tractor.